While recent years have generally been a smorgasbord of bad news for Mega Man fans, the past few months have had a few bright spots. In December of 2012, Capcom released Street Fighter X Mega Man, a free, retro-styled romp that pit the Blue Bomber against classic Street Fighter characters. Most recently, and perhaps of greater interest to long time fans, Capcom has been re-releasing the original six NES Mega Man games on the 3DS' Virtual Console. Mega Man 1-4 are already available on the 3DS eShop with Mega Man 5 coming in just a few weeks. 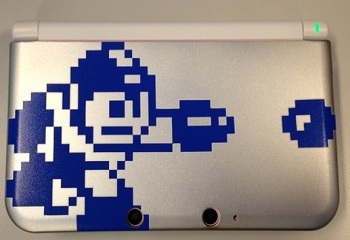 To celebrate the ongoing re-releases, as well as the 25th anniversary of the Mega Man franchise, Capcom is releasing a special edition protective case for the 3DS. "After the smashing success of our Monster Hunter cases (in both 3DS and XL flavors) we thought, hey, let's celebrate the whole NES series coming to the Virtual Console by making a Mega Man 25th anniversary case," said Capcom. "On the front you see this striking 8-bit Mega Man image, while the back has the 25th anniversary logo to commemorate two-plus decades of mega-goodness. They're not on sale just yet (still being ironed out / ordered) but they'll definitely be at SDCC - plus we'll have some for the Capcom Store too. And like the MH case, there will be regular 3DS/XL versions from which to choose." Though no price was mentioned in Capcom's announcement, the standard sized Monster Hunter 3 Ultimate case is currently being sold for $15.95 at the Capcom Store. Assuming the Mega Man case is of a similar design and materials it would probably be safe to point to a comparable price point. Overall, it's pretty nifty looking, and if you're a Mega Man fan there are probably worse things you could spend your money on. Then again, with two classic Mega Man games still coming to 3DS, you might want to save your pennies for those instead.